The Enbridge Ride to Conquer Cancer benefiting Princess Margaret Cancer Centre is an epic cycling journey from Toronto to Niagara Falls. Proceeds will support breakthrough research, exemplary teaching, and compassionate care at Princess Margaret, one of the top 5 cancer research centres in the world. 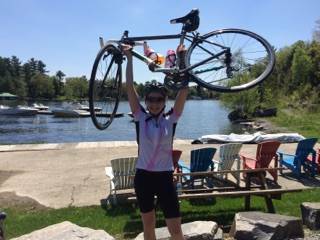 Dr. Facey is riding because she knows that cancer is too big a disease to ignore. It affects everyone, maybe you, me, our parents, kids, siblings or friends. Sadly, maybe all of the above. But by riding in this event we are doing something about it. We’re rolling closer and closer to the end of cancer. It’s an awesome triumph in a physical sense and emotionally as well.